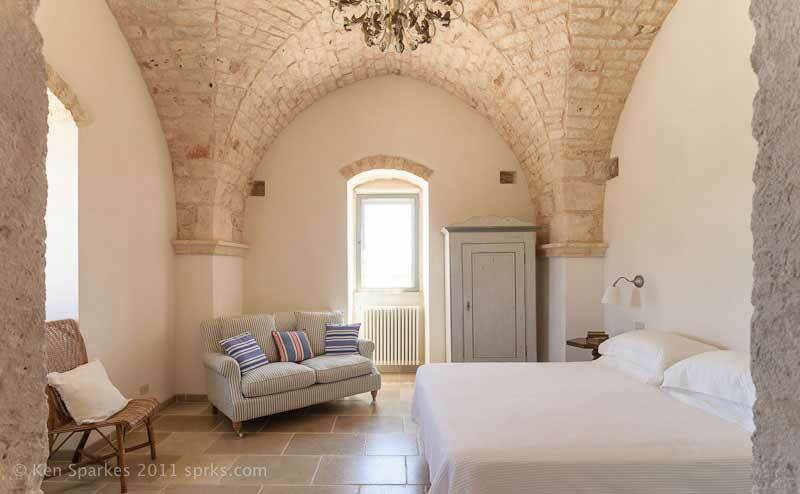 Masseria Cupina is a beautifully refurbished 18th century villa set in unspoilt countryside in Puglia, Southern Italy, and now available for holiday rental throughout the year. Nestled between the charming baroque towns of Martina Franca and Ostuni, the masseria lies in the heart of a vibrant farming community who welcome visitors with warm Puglian hospitality. 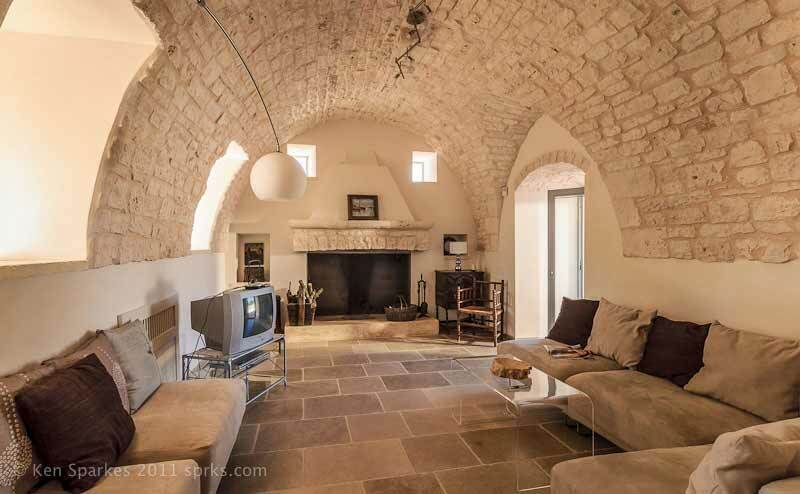 Originally fortified farmhouses, masserias are found all over Puglia and many have been converted into vacation villas for hire. But La Cupina is far from your typical masseria. Because it was built as a gift from father to daughter, no effort was spared to fuse the farmhouse with character and originality. Thanks to painstaking restoration work, Cupina is now fully modern but not at the expense of its idiosyncratic charms. These include the distinctive terra cotta red exterior uncovered when renovators chipped down to the original paintwork – a by-product of local ochre soils. Rough-hewn limestone floor tiles give Cupina a rugged authenticity throughout. 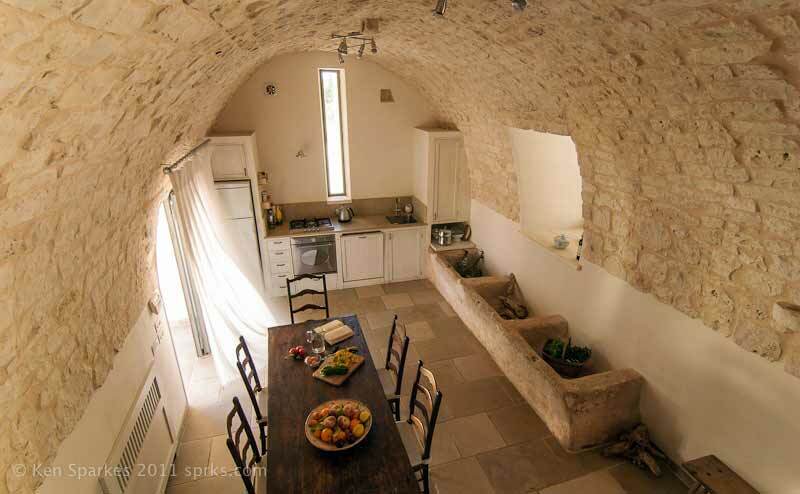 The villa’s well-equipped kitchen has a seated area so you can drink a glass of wine and keep an eye on your children while preparing a meal. And after the hard work is done, a beautiful dining area lends a tranquil setting to enjoy your meal. 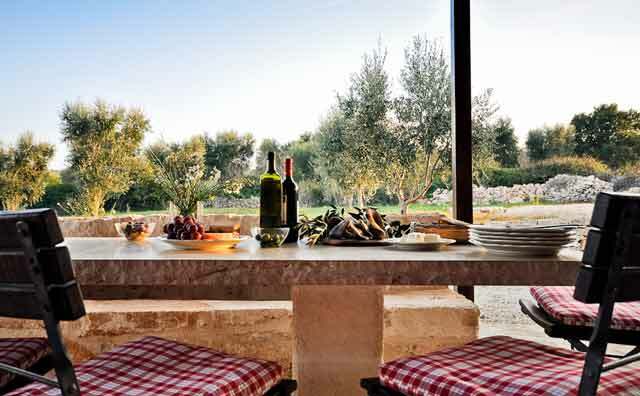 A connecting door leads directly from the kitchen to the veranda and its distinctive limestone table and stone benches, so you might prefer to dine outdoors and make the most of the gorgeous weather. And when it’s time to head indoors, you shouldn’t find it hard to chill in Cupina’s two elegantly furnished living rooms with long couches and TV and DVD facilities. Fully private, the villa sleeps seven people comfortably and is a perfect vacation destination for a large family or several couples. The Puglian nobleman who commissioned Cupina felt his daughter should have nothing but the best. 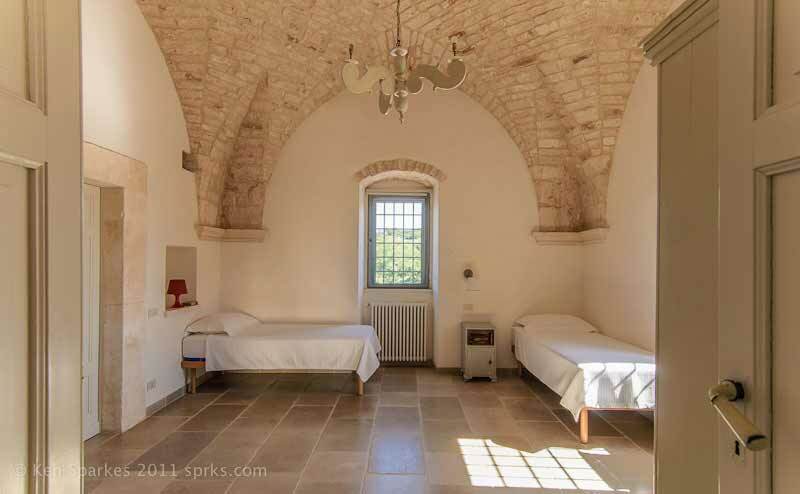 Hence, the beautifully crafted vaulted ceilings in all of the three bedrooms: a large double, a twin/double and a huge master bedroom, which has its own French windows and a balcony. Early risers can sip coffee on the balcony as the sun emerges from distant olive groves. At the other end of the day – if the mood takes you – it’s also suitable for a spot of romantic serenading! 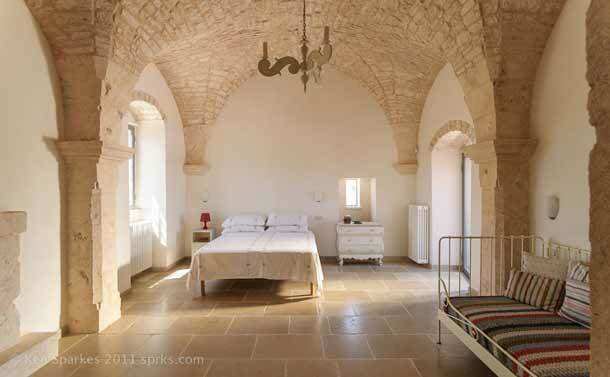 Intricate wall lamps made by a local craftsman are a recent addition, but supplement the restful ambience of the villa’s high-ceilinged bedrooms. 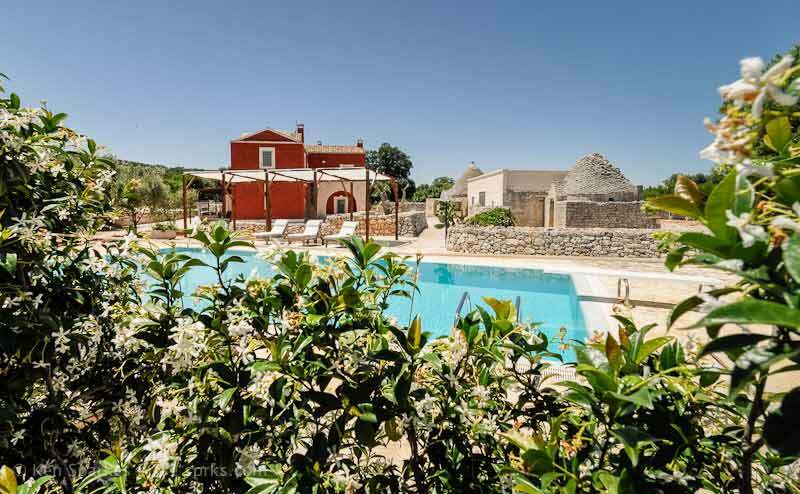 Puglia can get very hot during the summer, so Cupina’s 12 x 6 metre pool (with hand rails) is ideal for a cooling dip or burning some energy from hyperactive kids. Or for those seeking some pampering, the sun loungers are great for soaking in a few rays and knocking back a sneaky glass of wine (or two) ahead of a holiday barbeque. For some refreshing shade, head for the veranda at the other side of the villa. 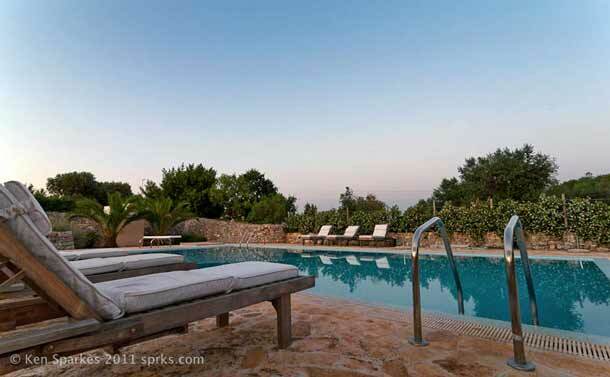 And to cap a perfect day, you can see some sensational sunsets from the pool area. Elsewhere in the spacious two hectare gardens, tumbledown stables and outbuildings add to the air of magic and tranquility. A dry-stone wall and stands of olive and almond trees offer total seclusion apart from the occasional tractor rumbling by as a local farmer uses a throughway to get to his land. You’ll also hear a train roll past every hour or so. At the end of the road, there’s a delightfully quaint train station manned by the stationmaster and his family. Until very recently, the road crossing barriers were operated by hand, but are now powered by electric. 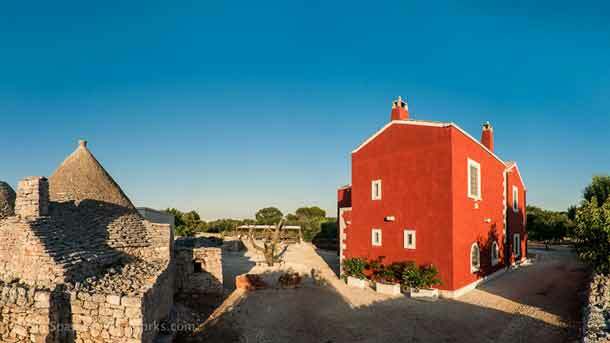 If you’re weary of driving, you can leave the car keys at the villa and catch a train to Ostuni, while the impressive Lecce is just an hour’s rail journey away.